Interested in joining D*action+Omega-3, but want to know more before doing so? Here are some commonly asked questions and answers about the project and the Omega-3 Index test. Q: What is the Omega 3 Index? The Omega-3 Index is a blood test that measures the amount of omega-3 fatty acids (EPA and DHA) in red blood cell (RBC) membranes. 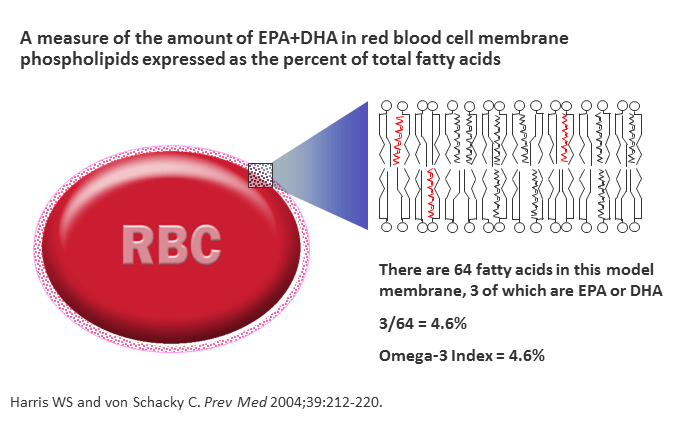 It is expressed as a percent of total RBC fatty acids. It is a long-term and stable marker of omega-3 status, and it reflects tissue levels of EPA+DHA. An Omega-3 Index over 8% is associated with the lowest risk of death from heart disease and below 4% with the highest. Watch this video for a fun description of what the Omega-3 Index measures. Q: What is the cost of the test? 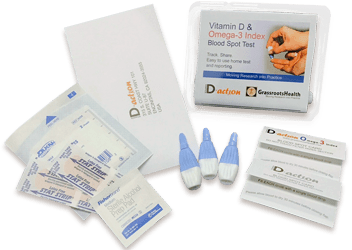 The Omega-3 Index test comes with the vitamin D test; the combined cost is $99 plus $5 shipping for a single kit, or you can choose to subscribe to either a one year or five year subscription. With both subscriptions we will automatically bill your credit card and ship you a test every 6 months. Choose the one year subscription to receive one kit now and another kit in 6 months at $97 plus $5 shipping each, or the five year subscription for a kit every 6 months at $95 plus $5 shipping. The cost includes the collection kit, the envelope to send in your blood spot, and a detailed report of your results, which will include your Omega-3 Index and your 25(OH) vitamin D serum level. Q: Can I order the Omega-3 Index test separate from the vitamin D test? No, the tests are only available as a combination. Q: If I’m already a D*action participant, can I use the same log in and ID for the D*action+Omega-3 project? You will create a new login and password when you register to join D*action+Omega-3. You may use the same email address as your former D*action account, but write the new ID that is generated for you on this web page when you turn in your blood spot cards. Your D*action login, password and ID are still all valid for D*action – but if you are choosing to test both nutrients going forward you will use this new login and password. Q: Where do I go to order the vitamin D and Omega-3 Index test kit? You can order your test kit from the dashboard within your new account. Q: How quickly will the results be available? It takes 7-10 days from the time we receive your completed blood spot test with questionnaire until we post your results; incomplete questionnaires will cause an additional delay. You will receive an email (to the email address you provided as login to the D*action+Omega-3 project) when we have the results, which will be posted to the myResults page within your new account. You must log in to your account to view your results. Log in here. Q: Is the Omega-3 Index test fasting test? No. It is not necessary to fast before collecting your sample; however, it is best to collect the sample before taking fish oil supplements. Q: How do I collect a dried blood spot sample for testing? The process for collecting the dried blood spot samples for both our vitamin D test and the Omega-3 Index test is the same as that for the vitamin D blood spot test, with just a few exceptions. Be sure to write your new D*action+Omega-3 participant ID on both blood spot cards first. You may use the same finger prick for each blood spot card if there is enough blood. In case a second prick is needed, an extra lancet and band-aid have been included in the kit. You may refer to our how to video here, and apply it to both the vitamin D and Omega-3 Index blood spot tests. Q: I notice there is a pinkish tinge to my omega-3 blood spot card. Is this normal? This discoloration is normal and part of the testing process. The blood spot cards for omega-3 are treated with an anti-oxidant to preserve the unsaturated omega-3 fatty acids during transportation. Without this treatment it would not be possible to measure the Omega-3 Index accurately as the unsaturated fatty acids would get oxidized. The result of this treatment creates a light pinkish color on the sample collection card. Q: Will my blood spot test expire? The kit itself does not expire, however the completed Omega 3 blood spot sample does expire 28 days after the date of collection. Because of this, it is important to send your blood spot test back to GrassrootsHealth immediately after completion, and to complete your online health questionnaire as quickly as possible to avoid delay in processing. If you delay too much in filling out the questionnaire after your blood spot date, then we may ask you to fill out another blood spot card. Q: What happens to my blood spot sample once my test has been completed? After the lab reports results, they store the blood spot cards in freezers for a period of 90 days. At the end of the 90 days, they are destroyed following the laboratory’s procedure for biological waste. Q: How is the Omega-3 Index different from other fatty acid profile tests? A single finger prick should provide enough blood to measure your Omega-3 Index. This eliminates the need to have your blood drawn at a clinic and the hassle of sending hazardous materials (blood) through the mail. You can collect your sample and send it through the mail from the comfort of your own home! The Omega-3 Index test can give you an unbiased view of your dietary intake of omega-3s as well as a relative measure of heart disease risk. Other fatty acid tests do not use the same analysis methods and cannot be interchanged with the Omega-3 Index. The unique method used with the Omega-3 Index test has more research behind it than any other commercially-available test, and new studies continue to be published. Q: If I am taking omega-3 supplements, won’t my Omega-3 Index be above 8%? Not necessarily. There is no way to predict – for any given person – what your Omega-3 Index will be just by knowing how much fish you eat or how many capsules you take. Individual differences in metabolism, absorption, and genetics make it impossible to predict with certainty how a given person will respond to supplements. Q: How can I know if I am getting enough omega-3? The only way is to directly measure the Omega-3 Index. Q: What is the target range for the Omega-3 Index? The target Omega-3 Index is 8% and above, a level that current research indicates is associated with the lowest risk* for death from coronary heart disease (CHD). This is also a typical level in Japan, a country with one of the lowest rates of sudden cardiac death in the world. On the other hand, an Index of 4% or less (which is common in the US) indicates the highest risk*. At present, there is no reason to suggest that the target should be different for men vs. women, or for different age groups. Whether there is an upper limit of safety for the Index is not clear, but there is likely a value above which there is not likely to be any additional health benefit. Further research will help define this level. *In this context, “risk” refers only to that associated with differing levels of omega-3 fatty acids. Risks associated with other factors such as cholesterol, blood pressure, diabetes, family history of CHD, smoking, or other cardiac conditions are completely independent of the Omega-3 Index. All risk factors – including the Omega-3 Index—should be addressed as part of any global risk reduction strategy. Q: What can I do to change my Omega-3 Index? To increase your Omega-3 Index, you need to increase your intake of EPA+DHA. The amount you would need to take in order to raise your Omega-3 Index into the target range (>8%) depends in part on your starting level, but it cannot be predicted with certainty as described above. Nevertheless, if your Omega-3 Index is between 4% and 8%, it may take an increase of EPA+DHA intake of 0.5 -1 gram (500 – 1000 mg) per day. This can be accomplished in two ways: eating more oily fish and/or taking fish oil supplements. On the other hand, if it is less than 4%, it may take an increased intake of 1-3 g (1000 – 3000 mg) per day. Although this can be accomplished by eating more oily fish, fish oil and other marine omega 3 supplements are usually necessary to achieve this level of EPA+DHA intake. Q: What is the purpose of the reference ranges for the Omega-3 Index? Included with each the 5 classes of fatty acids are “reference ranges.” The reference range is provided simply to give an idea of how these values compared to a large number of others taken from a relatively healthy population. In the case of the RBC assay, the reference range was taken from approximately 11,000 individuals whose samples were submitted to the laboratory for analysis. In the case of the dried blood spot assay, the reference range was taken from approximately 27,000 individuals. No information regarding the state of health of any of these individuals is known. In both cases, the reference range encompasses 99% of the individuals in their respective populations. Although “average,” these are not necessarily “optimal” levels, i.e., target levels or levels that one should to attempt to achieve. Providing an actual target or optimal level for the Omega-3 Index has been adequately validated by much research. Q: Does your lab follow Good Lab Procedures? Are your assays validated per FDA guidance? Yes, the lab we use (OmegaQuant) follows Good Laboratory Practices. All of their assays are validated. In particular for plasma/serum total and free (i.e., unbound) concentrations of EPA, DHA, DPA and ARA have been validated per the Guidance for Industry: Bioanalytical Method Evaluation (FDA; May, 2001). For more FAQs on D*action and D*action+Omega-3, visit our FAQs page.